E. Clare Stewart is graduate of Fisk University and Meharry Medical College, School of Graduate Studies and Research. She currently serves as the Community Coordinator for the HBCU Wellness Project at Fisk University. Follow her on twitter at @EClareStewart. Meharry Medical College is the fulfillment of a promise, repaying an act of kindness. Whether this story is true or a tale spun from the musings of an old man, Samuel Meharry along with his four brothers, donated $30,000 in cash and property for the establishment of the Medical Department of Central Tennessee College, the first medical school in the South to open its doors for the education of black physicians. Central Tennessee College changed its name to Walden University in 1900. 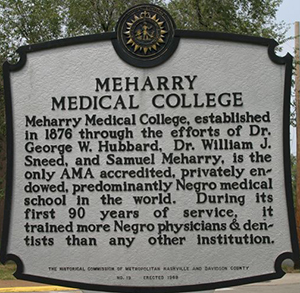 Meharry Medical College was granted its own charter in 1915. Walden University moved its campus in Nashville and the medical college remained in the original buildings. By this time, the school included dentistry, nursing and pharmacy departments. 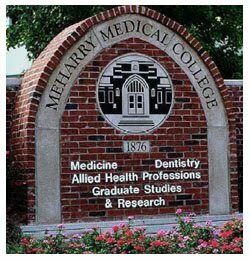 Today, Meharry Medical College is the largest private historically black institution dedicated to the education of health professionals. The college is home to schools of medicine, dentistry and a graduate studies, each conferring the degrees of MD, DDS, PhD, MSPH and MSCI, respectively. Graduates of Meharry take the university’s motto, ‘Worship of God Through Service to Mankind’ to heart. Nearly three-fourths of the colleges’ alumni work in communities demonstrating great need. As published in the Washington Post, last June, graduates of Morehouse School of Medicine, Howard College of Medicine and Meharry are nearly four to five times more likely to practice in underserved areas. Meharry’s commitment to health is not limited to the production of health professionals. The college houses research centers as well. These research centers positively impact the health outcomes of the poor and disadvantaged populations. These research centers include Center for Women’s Health Research, The Sickle Cell Center and Center for AIDS Health Disparities Research, formerly under the leadership of James Hildreth, MD, PhD. The Robert Wood Johnson Foundation, a philanthropic organization devoted to improving health and health care for all Americans understood what is happening at Meharry and the health professionals it produces, so in 2009, the establishment of a national health policy center was announced. Today, the policy center trains Meharry and Vanderbilt University student to engage in health services and health policy research. With the Salt Wagon in mind, Meharry Medical College presses forward serving man as worship to God.